The tithe is holy and sacred before the Lord. As a tither, your heart in coming to present your tithe is of the greatest importance. If you’ve been tithing as a religious routine, out of compulsion and without faith—that’s just bucket plunking. That’s not tithing. One who gives cheerfully and with honor and respect is a true tither in the eyes of God. Years ago, the Lord instructed Kenneth and Gloria Copeland to spend time tithing, rather than just separating the money and dropping it into a bucket. So, they began to go before the Lord with their tithe in hand, getting on their knees, laying hands on it, and taking Communion over it. Taking Communion over your tithe turns what could be a religious act into one of worship and reverence. It treats the tithe as holy, and ensures your heart is right before God. 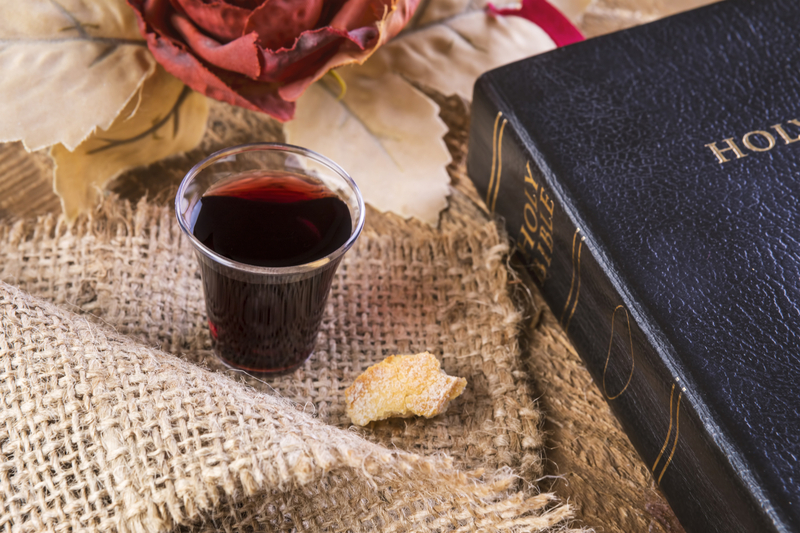 The Lord’s Supper is much more than just a religious tradition—it symbolizes everything Jesus did for us at Calvary. When you partake of the cup (representing the blood), you are remembering that Jesus delivered you from sin. When you eat the bread (representing His body), you are acknowledging the physical and spiritual torment Jesus endured to deliver you from temptation, addiction, worry, care, fear, poverty, lack and every part of the curse. It is an act of worship, faith and love. You can take Communion any time. Taking Communion is appropriating the blood of Jesus over your life, thanking Him for ALL He has done. It isn’t a religious ceremony, so you don’t have to wait for a minister to serve it to you. Examine yourself before you take Communion. Before we partake, the Bible tells us to examine our hearts (1 Corinthians 11:28-29). Ask God for forgiveness in areas where you’ve missed the mark (strife, unforgiveness, jealousy, envy, hatred, covetousness, fear, worry, unbelief, etc.). Also, be sure you are not receiving Communion just as a religious exercise, rather than accepting everything Jesus’ sacrifice provided. Don’t receive it halfway; that will keep you from receiving everything provided by Jesus’ sacrifice. Come to the Lord with your tithe in hand. If you tithe by text-to-give or automatic withdrawal, that’s fine—but take some type of receipt to the Lord and spend time presenting it to Him. Then, bow before Him. Get on your knees and spend some time being quiet and listening. And every moment, the tithe you hold in your hand will get more precious. Partake of the bread, which symbolizes the physical and spiritual torment Jesus bore to redeem us from all areas of the curse. Father, I give You thanks for all You have provided for me through the New Covenant in Christ Jesus. I partake of those promises now! I am redeemed from the curse of lack. I am the head and not the tail. I am above and not beneath. I present my tithe to You as an act of obedience and worship. I thank You for the promises You make to the tither in .Thank You for rebuking the devourer for my sake. Thank You for opening up the windows of heaven and pouring out blessings I can’t contain. Thank You that all the works of my hand prosper. In Jesus’ Name. Amen. When you learn how to take Communion over your tithe, get ready for THE BLESSING to be unleashed! Place yourself before God and receive Communion as the children of Israel did—ready to worship Him with your tithe; and receive the blessings, rights and protection that goes with it. Take the time to put yourself before God over the Communion table. It will be time well-spent.